I’ll jump right to the punch line: this Mac & Cheese Stuffed Pumpkin was the best macaroni and cheese recipe I’ve ever made. That sounds overstated, but it’s true. And the thing is…I have a feeling I’ll want to say that after each recipe I try from Melt: The Art of Macaroni and Cheese. Forgive me, I may gush a little here but it is warranted. I thought I knew mac and cheese. This cookbook showed me nuances and places and directions that I never imagined mac and cheese could go. 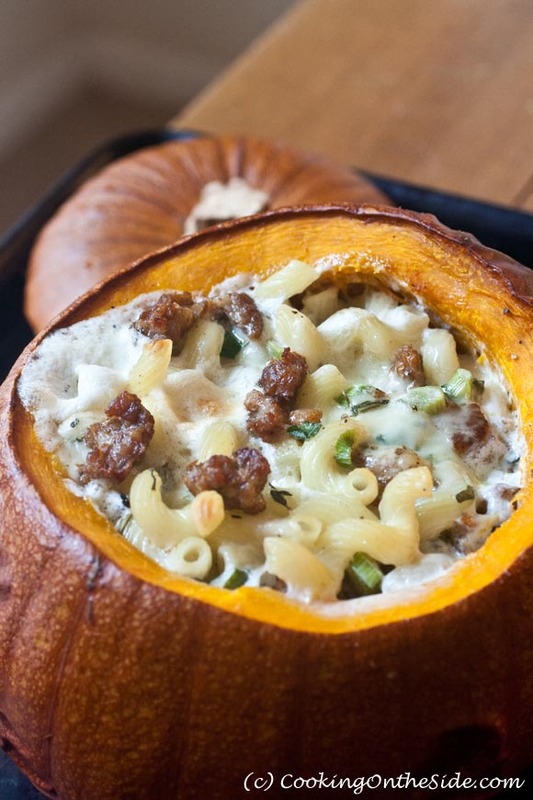 Take this recipe I’m sharing today, for example – which, in the book, is called Pumpkin Stuffed with Fontina, Italian Sausage and Macaroni. From the first glance, you know you’ve got something unique (my 3-year old has been bragging to everyone this week, “Mommy made mac and cheese in a pumpkin!!”). It’s not just a beautiful presentation, though – it tastes amazing too. The easy melting Fontina and Gruyère cheeses, the zesty sausage and woodsy herbs…all of these ingredients incredibly well-matched for the flesh of the sweet sugar pumpkin that contains them. My friends Stephanie Stiavetti (of The Culinary Life) and Garrett McCord (of Vanilla Garlic) not only know their cheese pairings inside and out, but they showcase them superbly with a deep respect for the ingredients. And the recipes go way beyond just casseroles. It’s all about pairing pasta and amazing cheese, in every delicious way possible. I keep flipping back to the Chicken Breast Stuffed with Leonora Goat Cheese, Star Pasta and Crushed Gingersnaps recipe as well as the sweet section. Yes, there is even dessert-worthy macaroni and cheese in there. The Fromage Blanc, Chevre, Peach and Ghost Pepper Cannelloni is such a dazzling concept! Without question, this is a book for cheese lovers. While I wasn’t familiar many of the cheeses mentioned, Stephanie and Garrett confidently guide us through what makes each cheese special and the right choice for the dish. 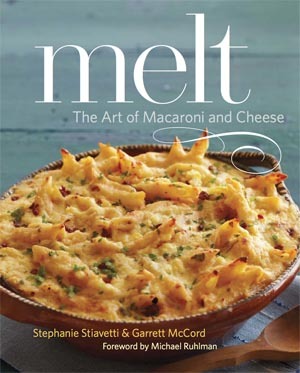 Melt is a true celebration of macaroni and cheese – a celebration I highly recommend joining! Preheat the oven to 350°F. Cut a circle from the top of the pumpkin at a 45-degree angle, the way you would cut open a pumpkin to make a jack-o’-lantern, and set aside. Scoop out the seeds and strings as best you can. Generously salt and pepper the inside of the pumpkin, pop the top back on it, place it on a rimmed baking dish (since the pumpkin may leak or weep a bit), and bake for 45 minutes. Meanwhile, heat the olive oil in a saute pan over medium heat. If the sausages are in their casings, remove the meat and discard the casings. Crumble the sausage meat into small chunks and cook until lightly browned. Remove the sausage from the pan with a slotted spoon and set aside to cool. Discard the drippings, or save for gravy or what have you. In a bowl, toss together the Fontina, Gruyère, sausage, pasta, scallions and herbs. Once the pumpkin is done baking, take it out of the oven and fill it with the macaroni and cheese. Pour the cream over the filling. Place the top back on the pumpkin and bake for 1 hour, taking the top off for the last 15 minutes so the cheese on top of the filling can properly brown. If the top cream still seems a bit too wobbly and liquid, give it another 10 minutes in the oven. The cream may bubble over a bit, which is fine. If the pumpkin splits while baking, as occasionally happens, be thankful you set it in a rimmed baking dish and continue to bake as normal. Great recipe with a beautiful presentation. I think your photo is excellent too! Thank you so much for the high praise! 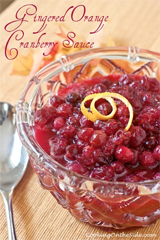 I’m so glad your family enjoyed the recipe and the book! I’ve got to say, after seeing your photos I think I need to go and make this for myself again! 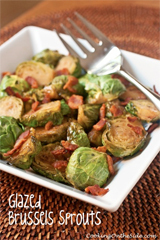 You and Stephanie must have had an amazing time creating all of these wonderful dishes! And thank you for this wonderful post. So glad your boy liked the dish. Little ones are a tough crowd! This is such a beautiful presentation! A great recipe too. Definitely inspires me too try cooking Mac and cheese in different ways. Wow! 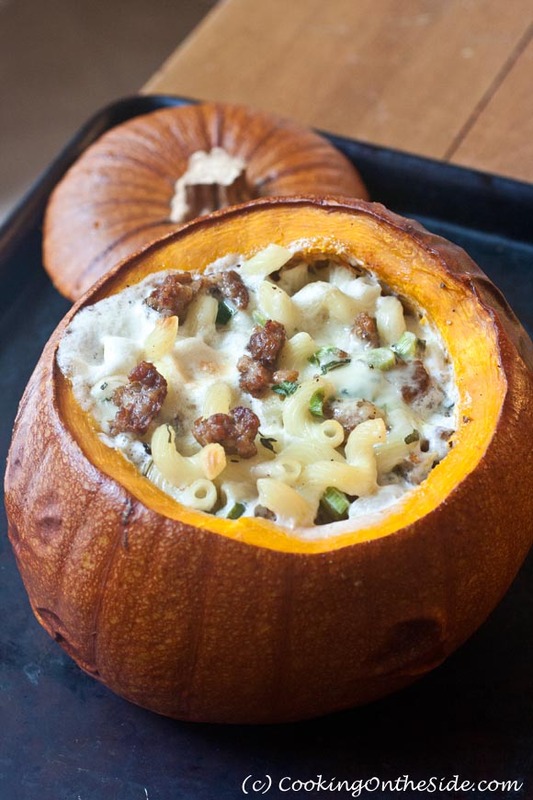 That is so cool – my kids would LOVE eating out of a pumpkin, too… who am I kidding… I would LOVE it, too -ha! What a beautiful dish! Looks delicious. Stephanie @ Plain Chicken´s last blog post ..What’s For Dinner? AMAZING!! Just made this tonight. Really easy and tasted awesome! They guys really liked it. I used chicken sausage since I have a non-pork eater. Went well with the unoaked Viognier (I had a Hilmy Cellars wine). Hello! 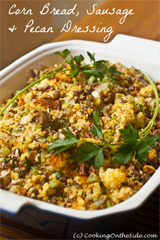 I am going to make this for my pot luck at work!! Do you feel like any of it could be done the night before? What a fantastic idea!!! If I was wanting to quadruple this recipe for a Fall themed dinner, do you think it would still cook and turn out fine if I quad the ingredients and cook in a larger pumpkin? Thanks much. Do you think I could make it in individual pumpkins? Like the little ones, so everyone has one on their plate? Next post: Cranberry Nut Bread…Properly!